The list of starters included Aussies, Kiwis and one Austrian, Reini Gelder. Based solely on a couple of missing letters, Reini home country was closer to Australia than New Zealand so happy to call him one of ours to keep the rivalry going! 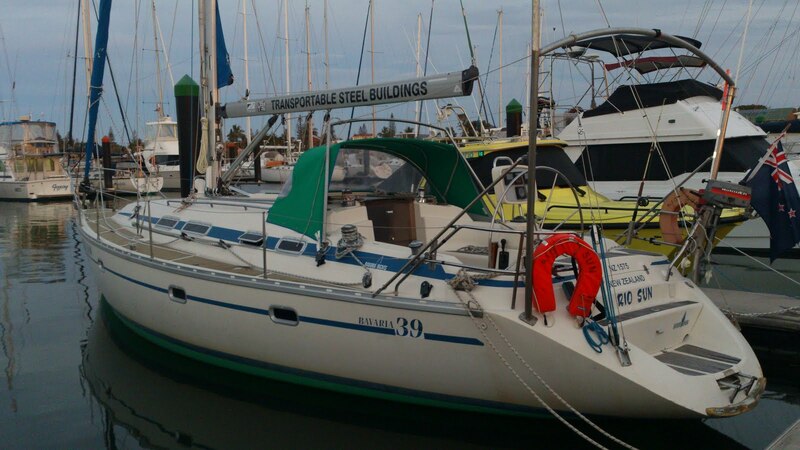 Reini is the owner skipper of the very slick 1980's Lock Crowther trimaran 'Ave Gitana' (Shark Angels), the sole sister ship to Bullfrog Sunblock, the 1986 and current Solo Tasman record holder. Reini has done a remarkable job refitting Ave Gitana to a balance between race spec and world cruising comfort. Together they have completed several circumnavigations.....quickly! I recall Reini saying he lived in a van under the tri whilst trying to work and pay for the refit. Dabulamanzi' skippered by Oli Oborn is an old beautiful Nicholson 55 world cruiser that he is fortunate to skipper for her international owner. Surprisingly she had an IRC rating (1.046) and the owner needed to get the boat to Mooloolaba, so Oli suggested why not race her....and he agreed! Oli's family flew to QLD and met him on arrival. So we now had our second IRC competitor. She may be old, but she is a very powerful boat with a ton of sail area.....its going to be tough for old 'Rogue' as the smallest IRC entry and lowest handicap of 0.931. Then we have two Young 11's; 'Outside Edge' skippered by Peter Gaddes (AUS) and 'Road Runner' skippered by Alan Ward (NZ). I reckon these guys likely had a little wager on this 1320nm match race! 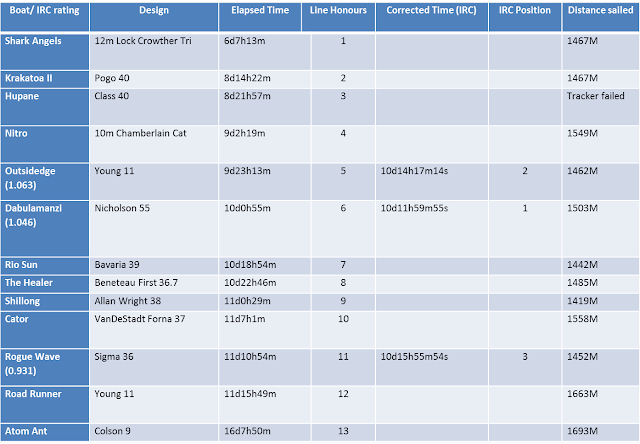 Young 11's are quick; very quick racer/cruisers and both were adorned with extended bowsprits and race sails. Pete was taking around 20 minutes to complete a tack as he stacked sails from the lowside to the highside......I may have been cooking bread while that action was on! Weighing in at a lightweight circa 4000kg displacement, my Sigma 36 carries an additional 2250kg when empty and more like 3000kg wet. 'Outside Edge' (1.063) makes up the third and final boat in IRC, so I figure if I can keep I keep close to the pace of these two, then there is hope! Next is Bob Wise in his 11.2m Alan Wright designed 'Shillong', an accomplished offshore and racing sailor with an outstanding sailing background and a gentleman. Watch out for the ole 'wise' one! Ian Thorne skippers "Rio Sun', a 11.75m Bavaria 39 with roller cruiser racer complete with furling mainsail. Ian said the beauty of his system was he could adjust sail trim and balance by taking in just a small amount of sail whereas we would need to commit to a full reef, de-powering the sail. Mark Hipgrave is another Australian who ventured across to challenge the Kiwis. His Beneteau 36 "The Healer' is another of the smaller yachts and a quick Cruiser/Racer to be watched. Lisa Blair sailing a borrowed 'Cator of Margaret River', a Van de Stadt 37 and the only alloy boat in the fleet. The large volume, light displacement, deep draft and large sail area including bowsprit gave her an edge and she would also be up on the pace. Lisa has had a fast track career sailing in the Clipper Race completing the entire circumnavigation with the assistance of supporters. She recently acquired an Open 50, raced to Hobart and is now prepping for an Antarctic circumnavigation record attempt. Next we have Cory McClennan in his red and racy Colson 9m 'Atom Ant' and the smallest boat in the fleet. Cory received an age waiver to compete and has secured some great sponsorship deals. Cory probably had the hell trip of all entrants, with his autopilot constantly failing. Despite the setbacks he persevered and completed the race. Cory is a great guy with ambition and is now preparing for a Mini Transat campaign his recently acquired Mini 650 sponsored by B&G. Working in Doyles NZ loft with some of the worlds finest sailors should bode well for Cory and we hope to see him back again in 2018. Graham Dalton in his super slick Class 40 'Hupane' and Steven Arms in his super quick catamaran 'Nitro'. The race within the race was always going to be 'Ave' Gitana' versus these guys. For the win, it came down to who could pick the best weather. 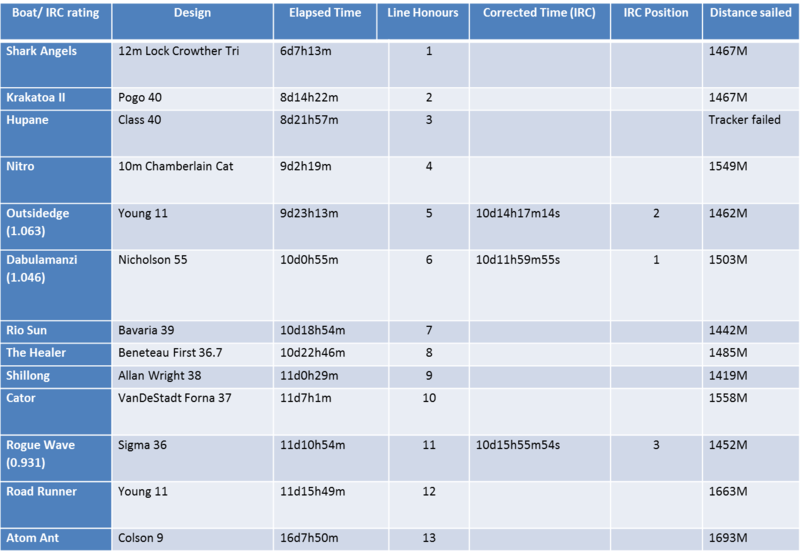 The results below demonstrate how competitive my old 'Rogue' is on handicap after 11d10h days of racing, only to be pipped by 1h38m for second and 3h56m for first place. I learned a lot during the race and will push harder when I return in 2018 as I intend to break the 10 day elapsed time barrier.